Strongest cancer fighting herbal plant, I have found in years! This unassuming weed is a white knight that fights Cancer, effectively! 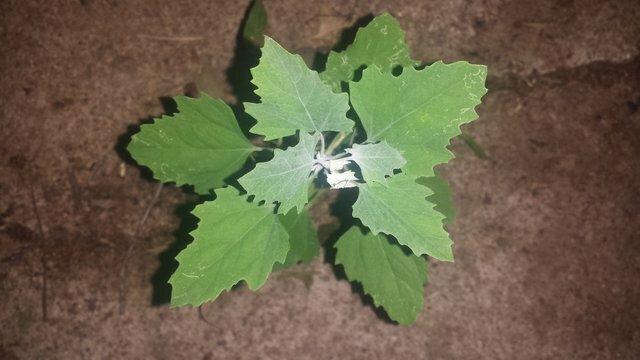 The weed is called Lambs Quarters or Pig Weed; and it is the most powerful anti cancer agent I have found in the herbal jungle! It grows wild here in Oklahoma, and can be eaten raw or steemed. The stems are good to eat, as long as they are not fiberous. If a knife can easily cut the stem, you are fine. As with all greens it takes a lot of volume, because they cook down significantly. The taste is mild when cooked, and works very well in a salad, raw. No herbal is a panacea or a cure all; but if I had this problem, I would eat this plant starting today, and as often as I could get some thereafter! I love herbals! They have done me a lot of good. I have been using them, exclusively, for over a decade; and my health is continually improving. I am working towards wildcrafting, and on site growing of as many different herbs as I can find. I recently located wild Mullen and plantain and will post them as soon as I can get the pictures. I planted hawthorne tree, and will post that as soon as it blooms! Bought echenacea and fever few seeds, and I am trying to decide where to plant each. Yes, these grows like weeds, Oh wait, they are weeds, LOL! :) I was able to harvest enough for salad, but not enough yet to cook (it cooks down like all greens) yet. These plants are fought by most gardeners, when they should be harvesting them. I am always interested in weeds I can eat and their benefits. Time to go huntin'. Thanks for this! Glad to help! This is a pretty exceptional weed, LOL. I will wildcraft some tomorrow for a friend who's having some problems and can't get out. Interesting! I will have to look into this leaf some. This is the first I’ve heard of it! Thanks for sharing!!! We used to eat this a lot, when I was a kid. Because it was free, and that was the right price. Still like it, think I will cut a bunch soon.